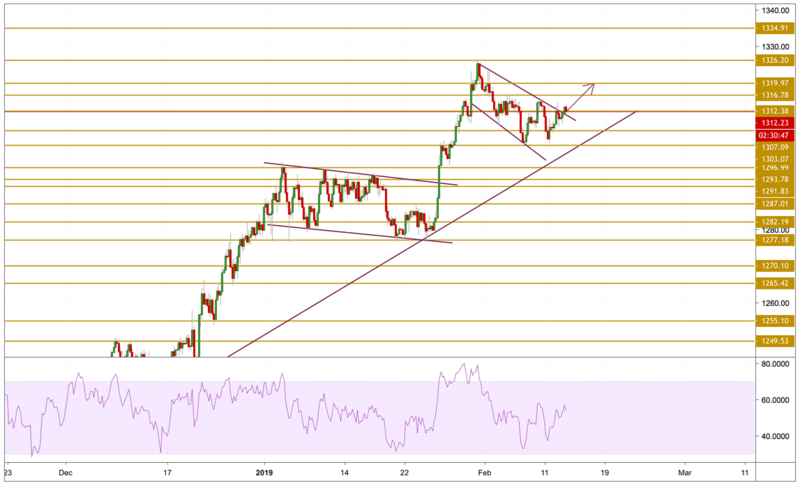 Gold prices rallied back above the $1310 level following a correction in the greenback's impressive bull trend. The correction came despite the US yields which remained elevated while US stocks added to the recent gains. News that US-China trade talks are making progress and a deal in principle between the US Republicans and Democrats over 'the wall', decreasing the chances of another government shutdown. Gold prices edged higher as expected during yesterday's session above the $1310 level but remained capped below the $1313 level. The price is currently hovering around the $1312.38 resistance level after breaking above the upper band with an improved momentum. The price needs to make its way above the $1315 to confirm the breakout so we can see another retest of recent highs. The level we will be watching is the $1320 level.